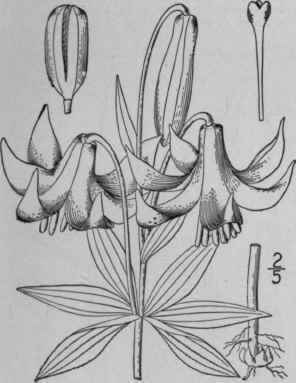 L. andinum Nutt. Fras. Cat. Without description. 1813. Lilium umbellaium Pursh, Fl. Am. Sept. 299. 1814. L. lanceolatum Fitzpatrick, Iowa Nat. 2: 30. 1907. Bulb similar to that of the preceding species, the stem usually more slender, 1°-2° tall. Leaves linear, blunt or the upper acute, ascending, or sometimes appressed, 1-3' long, 1"-2i" wide, all alternate or the uppermost verticillate, their margins finely roughened; flowers 1-3, erect, 2'-3' high; perianth segments red, orange or yellow, narrowed into the claw, acute, spotted below, the claw shorter than the blade; capsule oblong, 3'-4' long, about 8" thick; seeds like those of L. Philadelphicum, of which species it may be a narrow-leaved race. In dry soil, Ontario to Ohio. Minnesota, British Columbia, Missouri, Arkansas and Colorado. Ascends to 4000 ft. in the Black Hills. June-July. 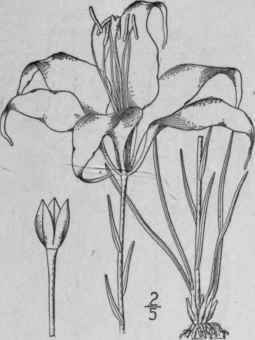 Lilium Catesbaei Walt. Fl. Car. 123. 1788. Bulb ¥-1' high, composed of narrow leaf-bearing scales, their leaves narrowly linear, 2'-4' long, often falling away before the plant flowers. Stem slender, 1°-2° high; stem leaves all alternate, narrowly linear or linear-lanceolate, acute or acuminate, erect or ap-pressed, I-3' long, 1"-3" wide; flower (always?) 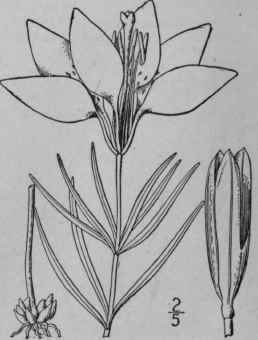 solitary, erect; perianth-segments scarlet with a yellow purple-spotted base and a slender claw, spreading or somewhat recurved, 3-5' long, 1/2-1' wide, long-acuminate, wavy-margined; capsule 1' high or less; seeds 2"-3" long. In moist pine barrens. North Carolina to Florida and Alabama. Reported from Kentucky, southern Illinois and Missouri. July-Aug.
Lilium canadense L. Sp. PI. 303. 1753. Bulbs subglobose, 1'-2' in diameter, borne on a stout rootstock, composed of numerous thick white scales. Stem 2°-5° tall, slender or stout; leaves lanceolate or oblong-lanceolate, verticil-late in 4's-10's or some of them alternate, acuminate, 2'-6' long, 3"-15" wide, finely roughened on the margins and on the veins beneath; flowers 1-16, nodding on long peduncles; peduncles sometimes bearing a small leaf-like bract; perianth-segments 2'-3' long, yellow or red, usually thickly spotted below, recurved or spreading, not clawed; capsule oblong, erect, 1 1/2'-2' long. In swamps, meadows and fields, Nova Scotia to Ontario, Minnesota, Georgia, Alabama, Missouri and Nebraska. Ascends to 6000 ft. in North Carolina. Red-flowered races with slightly spreading perianth-segments resemble the following species, and races with strongly recurved segments, L, superbum. Field- or meadow-lily. June-July.